Why doesn't my website display properly in Facebook Browser? Why doesn’t my site display properly in the Facebook in-App Browser? Have you noticed that the Facebook App uses an “in-app” Internet Browser? This means that when you click a link on a Facebook post, instead of opening in the main Chrome or Safari App (or whatever your phone’s default browser is), the target site actually opens inside a Facebook window. On Android devices, this behaviour can currently be turned off in Facebook App settings, so links open in your chosen browser as normal. On Apple devices, it cannot be turned off. Why has Facebook done this? Facebook says that it speeds up the user experience because they don’t have to switch to the full browser. They might have a point on older phones, but the difference on modern fast phones between opening a site in the in-app browser and opening it in Chrome, for example, is negligible. I expect the real reason is that Facebook doesn’t want you to leave. You are the product that Facebook is selling to its advertisers and if it can stop you from leaving Facebook and serve more adverts to you, it makes more money. This might also explain the difference between it being optional (but default) on Android and mandatory on Apple phones – on Android, there is a “Back” button that navigates between apps, so pressing back from the site in Chrome will go back to Facebook, but that facility doesn’t exist on Apple. How does this alter the site visitor experience? The most important potential issue is that the site might not display as intended, leading to confusion for the visitor and loss of revenue for the site owner. Facebook is using the main browser app (e.g. Chrome or Safari) inside Facebook, so in theory, sites should look right. In practice, it doesn’t work out like that. Sometimes sites are broken in the Facebook in-app browser. I have seen a few examples. Things I’ve spotted so far are buttons appearing in the wrong place and background images not appearing at all. I expect this site will be fixed soon, so I’ll describe it too. 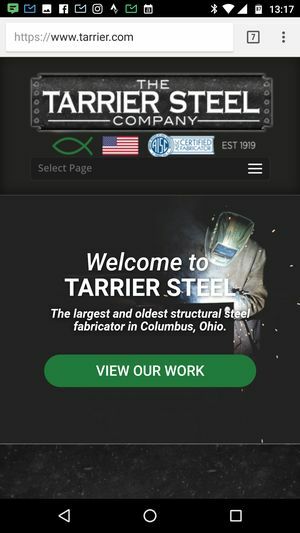 https://www.tarrier.com/ Currently, if you paste that link into a Facebook post and then follow the link from that post, the homepage is missing some background images which is a huge problem. 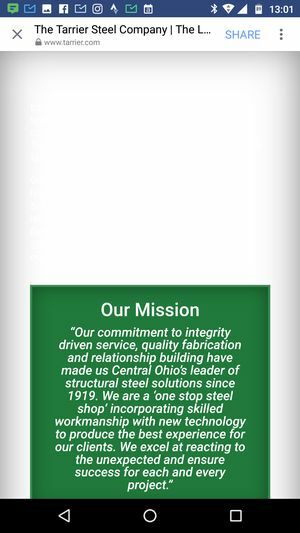 White text is readable on a dark background image, but it completely disappears on the phone. Note: the site works fine in the full Chrome and Safari Apps on the phone – it’s only a problem in Facebook’s in-app browser. See the fixes to debug the facebook in-app browser (in most cases) below! And here’s the Facebook in-app version with the text completely invisible because it’s white on white! So far, I have seen a few different scenarios that cause things to disappear in the Facebook browser. In most cases, you have mixed content issues. You are serving pages encrypted via https, with an SSL certificate, but some of the content is hard coded with “http” at the start. This might be because you switched from http to https for example. Your options depend on the amount of work involved. If you are able to find and replace in the database, you are best off doing that (after backing it up!). If it’s only a couple of images, then it might be quicker and safer to just reapply them. It might be that you are embedding a 3rd party piece of content (e.g. a Widget) and they don’t use https, in which case, your only option is to remove it or live with it (or ask them to get encrypted). I’ve seen some cases where there is no mixed content, but portions of the content disappear from the iPhone Facebook in-app browser, but not from the Android Facebook in-app browser. This appeared to be due to wordpress page builders having a fight! Do if you try and use the Elementor page builder with the Divi theme that has its own page builder built-in, it can cause this issue. The solution was to change theme if Elementor was still needed. Additionally, I’ve seen a case where Elementor was not loading scripts asynchronously, so sliders were being called before their script was ready and thus appearing as blank space. Check Elementor settings for the “async” option. It also appears that iFrames can cause issues too with the Facebook browser refusing to render it and crashing the whole page with ERR_CONTENT_DECODING_FAILED message. If this has helped save you lots of time and grief debugging, please consider helping out with a donation towards my next pair of running shoes! Much appreciated. Read on for more issues with the browser. 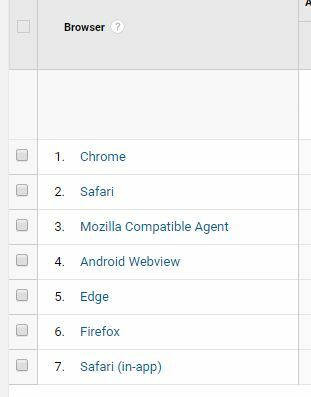 The next issue is that it messes up the “technology” section of Google Analytics. Safari has a reporting section for “in-app”, but Chrome doesn’t make the split. You can fix this by creating a custom dimension, applying it to your website and then adding it to reports in Analytics. Fiddly, but useful. 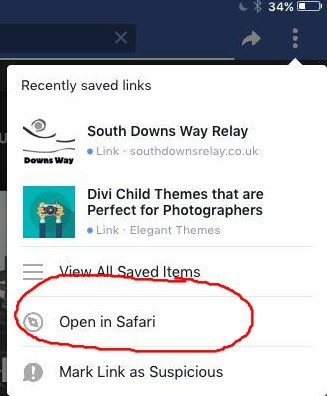 Within the in-app browser, Facebook only gives you the option of “save” for a link, which saves it in Facebook’s own app. The history does not sync to the main browser app either, so If you use Google Chrome, there will be no record of the site in Google’s history and no way of adding it to your Google bookmarks. In both Android and Apple, from the in-app browser, there is the option to open the link again in the default browser. It’s a bit of a faff, but if you want to add it to your bookmarks and history, it’s the quickest way. Devices: PC, Android tablet, Apple iPad, phone. thank you for the article. I am having the same issue with my website, however it completely messes up the fonts and some of the pictures. Have you had success in resolving how a website looks through the Facebook browser? Hi Ivan, no I never put any time into solving it because it hasn’t happened to any of my sites yet. I just put on the list of things to check before go-live. I’m not even sure how to debug it like you would in Chrome on a PC. What theme are you using? 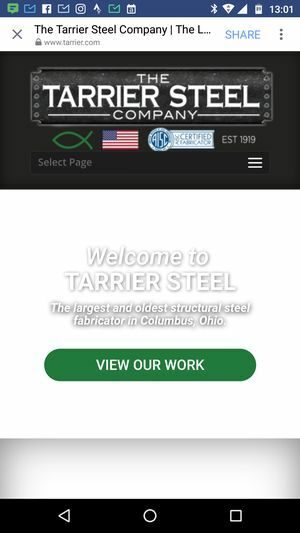 What’s your site? Hello, Charlesr, I used divi built a website, my website address is www.pawtrails.ie, it is responsive to mobile screens, but I found when I open the link through facebook social media in my mobilephone, the toggle button is not clickable anymore. It is clickable in google chrome browser. What is the cause for this? And what should I do for this please? I tried other social media, such as Wechat, the toggle button has the same problem. Thank you so much, if you could give some suggestions, I really appreciate it! How annoying. I’m on a Motorola Android (G5Plus). Might be worth reporting it to Facebook. Hi Charles, thanks for this article, this is the only one I found.. I just launched a site this week and have encountered this problem for the first time… The site when viewed in Facebook’s in-app browser causes the following issues: mobile menu doesn’t work, the cookies “accept” button doesn’t go away after clicking and I’m missing gaps in the site’s content … what is the best way to get a hold of a human who can respond to this kind of issue at Facebook – via Ads? Thank you kindly! Hi Steph, I don’t know of any way of addressing this issue. Facebook reply to things I report with “blah thanks blah improving services blah”. However, it might not be their fault. I compared the site on Chrome and the Facebook browser and I they looked the same. I could not see the cookies button on either and the menu worked fine on both. Which mobile device are you using? It might be phone vendors that need to do fixes. Difficult to know. I am running to the same issue here Stephanie. My navigation and sliders do not show up on FB browser but work fine in every other browser. Did you find a fix to this? Hi Taylor. Steph probably won’t get a notification of your message because the system wasn’t working at the time she postsed. However, she posted over on stackoverflow that the problem was solved for her when she updated the Divi theme. I think that’s what you are running on yours. Are you able to update it and let us know if it fixes it for you? (Maybe take a backup first). Just updated DIVI and nothing :(. I have a feeling this will never work right on FB. Would you consider giving me an admin user temporarily so I can have a look around, in case I can spot anything? If so, please email me the details. Thanks for your post about this. I have a custom built gallery feature on my website and the pictures aren’t loading in that facebook browser. Hi Jo. I wish I knew how to solve it! I can see the problem on my Motorola G5plus. I suggest you report it to Facebook to see what they say. I have reported it using your site as an example – I’ll let you know if they say anything other than usual “we are working on improving the facebook experience blah blah” 😀 Have you tried a different gallery plugin? Also, check out my other post on getting the social sharing pic to look good – your sharing image no Facebook has the bottom and top hacked off. Oh great news Jo. Please would you share more details on what you changed? Or message them to me if it’s more appropriate. Facebook’s predictable reply was the copy/paste: “We’ve received your report and appreciate your patience as we work to fix technical problems on Facebook”…. I am also having the same problem. It loads the first of 3 items in a gallery and loads the second 2 as broken thumbnails. The links still work but the image doesn’t load? Could you share what you did to fix this issue? Hi Sam. I didn’t hear back from Jo. I’ll send you an email. We get a similar issue, we’ve blog posts being shared on our Facebook timeline and until I installed the FB and to look, we’d not realised that it was loading nothing. This is really affecting views for posts that’ve had a lot of effort put into them. It works fine on all mainstream browsers. My default on my S7 is Chrome and I assume from the above that FB is embedding the content in the app using Chrome, but it’s just not working? Any pointers would be dearly apprecaited. Oh wow. It’s not just bits missing Duncan. It doesn’t work at all 😮 I just get a blank page. I’m not near my PC right now. What software? WordPress? And if so, what theme? If you briefly switch to different theme (like the WordPress default theme) does it start working? Please report back. Back at my PC now. I see it’s something else, perhaps Drupal. It looks like pretty simple html apart from the script in the header that grabs the css. Is there anything you can disable? Like the popup that appears immediately when you arrive? Ah ha! I’d forgotten the developers had put that up and didn’t realise it was on every page! Defo going to remove it and see if it helps. It’d make sense. It was a temporary measure until we’d dedicated sign-up page. We’ll just leave it on the homepage for now and see if that helps the articles render properly in FB. Hey I’m having an issue where my coupon code and pricing for my order form won’t show up in fb browser, but it will in chrome and safari on mobile. Any way I can email you my site link? Thanks. Hi Phil. I replied via the drift messenger. Hopefully it sent you some messages via email. Did you get them OK? I tried the link via facebook browser on my phone, but it looked ok to me. Did you fix anything in between? It’s amazing that you’re the only one who wrote about this bug. I too have this same problem. I guess it’s the http-to-https thing. 1. Is there a way to automatically redirect only FB users to non-ssl version of the site? Hi. I can’t see any mixed content. Try looking at the errors on your page using Chrome’s “inspect” tool (right click on page / inspect, and click the little mobile symbol to view the mobile version your pc) for clues as to what things are broken. Tough to know any more without being an admin. Also in other areas, the PC version of the page is pretty large (5MB), with a high number of data requests (363: https://gtmetrix.com/reports/www.xn--4dbcyzi5a.com/uQrNpMq6) and it is taking a long time to load (11 seconds on a PC with a good connection – the mobile version is much faster though, so that’s good), so you might want to look at improving that too. one is with regular chrome mobile browser, the other is FB browser. It wasn’t like that before, only in the past couple of months. 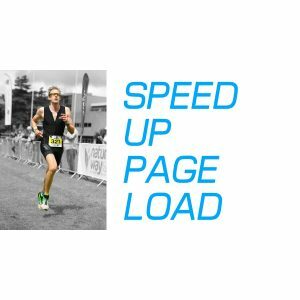 Are you using a page builder? Or just the normal wordpress editor? Try installing and using an app called “Inspect and Edit HTML” – it displays the site EXACTLY like fb browser does. Is there something this info helps with understanding about the solution? Hi Oren, can I just check what you mean? Where does it look like the fb browser? On a PC? Or in the default mobile browser? And do you have a site that needs looking at? It’s an app, so in mobile phone. I use android galaxy. My point it that the new app’s browser I mentioned displays the exact same broken structure as Facebook in-app browser. My site is on knb.is – when using regular browsing apps (Chrome, FF, Opera etc.) it looks great, but when using FB app browser (links in facebook) it gets broken. I found that the “Inspect and Edit HTML” app breaks the site exactly the same way, so I thought it might give a clue of what’s wrong. It got solved yesterday somehow. I contacted WP-TOUCH which is the plugin I use for mobile, maybe they fixed it. Thank you for the efforts and kindness! please brother help me.please.its very important. Hi Fahim. It’s working fine for me on my Motorola Android in the FB browser. The site loads and as far as I can tell looks the same as the chrome version. Did you fix it already? This saved me a good 4-8 hours of debugging. Thanks a ton! having an option to specify ‘_blank’ would be a big help here. What do you mean Dan? I don’t follow. Hi! Thanks for writing about this! I’m having issues with the Instagram for iOS in-app browser which I believe is the same as Facebook. There’s no way to “refresh” the browser so after making changes to my site I still see older versions of some of the site pages. This happens to customers too. Is there any way to avoid this? Thanks! Hi Matias. Never seen that before. Have you tried deleting the app cache on your phone? (You can do this in android – not sure you can in iOS without deleting the entire app and reinstalling). Perhaps also check it’s not a cache plugin or CDN issue at your end? (Delete / flush cache for either of those). Hi! Thank you for sharing this. I have the same problem and I don’t manage to fix it. My hosting says everything looks ok and in every other browser my website looks fine. But when I open a link on my Facebook page using the Facebook app it doesn’t show the images at all or sometimes it shows a few of them. After refreshing or opening the link again once or a few times it shows the images. Is there any way to fix this? Your help is much appreciated. Thanks. What’s the site? Have other people reported the same issue on your site? Not sure my reply was sent yesterday. My website is www.passievoorfrankrijk.nl and yes others reported this issue too. Is there a particular page / image that has this issue? The homepage looked fine on my first visit via a link on facebook. I’m using an android. Hi, it happens when clicking on any link. To my homepage but also to this link for ex: https://www.passievoorfrankrijk.nl/vallee-de-la-claree-topbestemming/ I’m using Apple. But there must be something wrong with my website because this doesn’t happen when I click on links from other websites. What does it mean: my favicon.ico was not found? Sorry, I can’t see anything wrong with the site. And the favicon.ico is the little 16×16 icon that appears in browser tabs. Chrome brower’s inspection tool is telling me that the site is trying to load it, but it can’t find it. It’s normally in the root folder. If you moved servers or something it probably didn’t get included in the move and just needs dropping back in. I need to hire someone to help me with this exact issue. Hi Charles, Thanks for the article. unfortunately I have the same problem also on my site… In Chrome and Safari browsers the site works great but in Facebook browser it doesn’t show the images on my website. If there is anything else that might help I would love to know. Hi, sorry for the delayed reply – your issue is just a mixed content issue. Change the images to https in divi settings (or better still, remove the domain bit of the url completely) and they will work. If you can’t figure it out, let me know. Glad it got you sorted! The bad part is, I am not sure, what is my next step. My problem is related to disappearing images and a few aesthetic settings. I would be super glad if you can point me to the right direction. I actually had that installed, but it was set to Simple. I changed to Widget, which fixed the bigger issues. Then I changed to Capture, but no further improvement, and too much risk that I screw up something else, so I think I leave it like this. Thanks. Re the beer – just because you asked so nice 😀 and I worked for a beer company 🙂 Any Paypal option? No fan of credit card payment. Im not sure Im confident about touching the database, but thanks a lot for your help! 🙂 Im at a much better place now with my website. Yeah weird one. As discussed in chat, try reducing image sizes by switching from PNG to JPG. I’m having the same problem as most people on here! 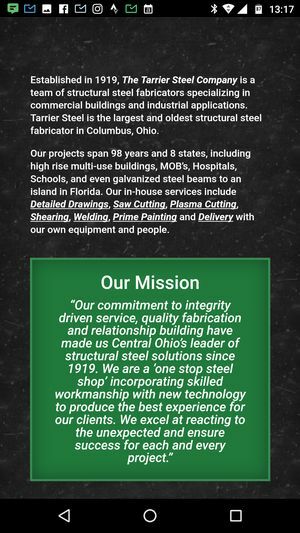 Helping a friend out with their website – their using a WordPress.org theme. I dabbled in using wordpress when I was at uni, so I knew I could change the simple things as my friend couldn’t. I ended up changing the theme, checked if it was mobile responsive, which it it – so I thought everything was perfect. So the website is fine on when I go through chrome etc but when I go on to the website via Facebook & Instagram some of images and videos aren’t responsive, the header widget should be white but it’s coming up black hence you can’t see the logo or the menu tab. The footer widget is coming up yellow but it should be black. Lastly the layout of the text is funny too. Can you help? I’m way out of my depths here. Hopefully still sorted as per our chatbot conversation. Thank you for this great article – very accurate and detailed. I wonder if you could have a peek any time soon at one website because we have an issue with it in facebook in-app browser. The idea is quite simple – you can post images on panoramas (mostly from Google maps), they are saved and kept, and finally you can share a certain panorama with your pictures as a link to facebook. The current problem is as the link is shared to facebook, the users would most likely just click it and will be redirected to facebook in-app browser, as they should not be worrying about copy-pasting it to safari for example. But in this browser the “move across streets” arrow buttons don’t work properly, and the most important: the button in the left top corner which is “home” alike – will redirect user to the full website under his login or too the login page, if no authorization credentials were found – does not answer the touch event as well. I could really use your help at least finding the direction where to work, since it’s a team project in which I joined recently and don’t know every rope to pull. I am not sure whether it is possible to debug facebook in-app browser with chrome – it does not appear in ‘remote target’ section. Sorry, I just meant when looking at the normal site in chrome. I checked and it didn’t report anything unusual. I couldn’t figure out your issue 🙁 If you solve it, please post the solution in case it helps someone else. Hi, I have a problem with facebook in-app browser, and it is, that mobile responsive menu have set a background color, which is not shown in facebook, so light buttons are hardly readable on light background … can you help with that?